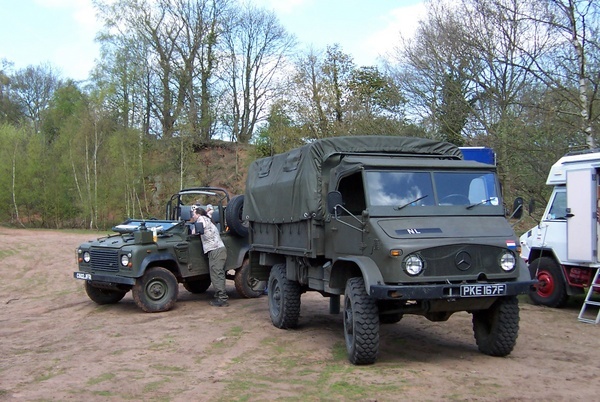 Gareth and Lorraine had arrived in a 404 troop carrier, absolutely immaculate. 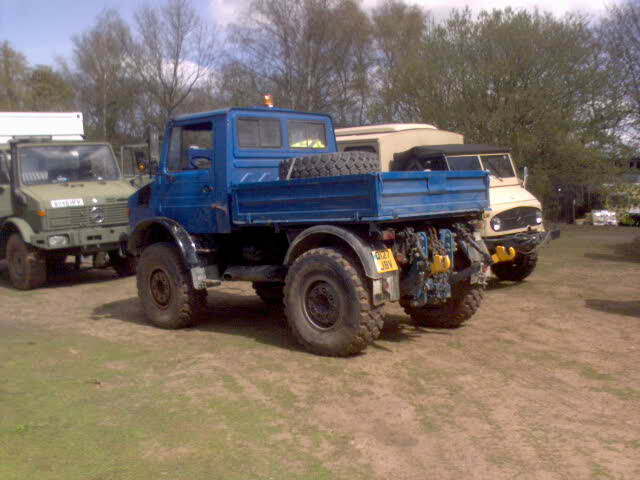 Had recently been downgraded to 3.5 ton (rather than 4.75) so legalities were eased. They'd come up from Essex, and along with everyone else revelled in all the mogs. Afformentioned John, our esteemed guest was being well treated. People let him drive, and took him for lots of runs. Was nice not to have to explain the levers to him. Was also nice to send him back to california with a sun tan! 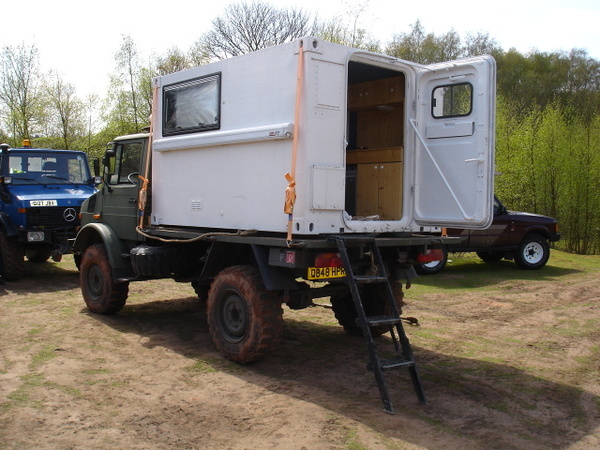 Rick and Amanda had come the short hop from Stockport in their U1300L camper, and a very nice job too. 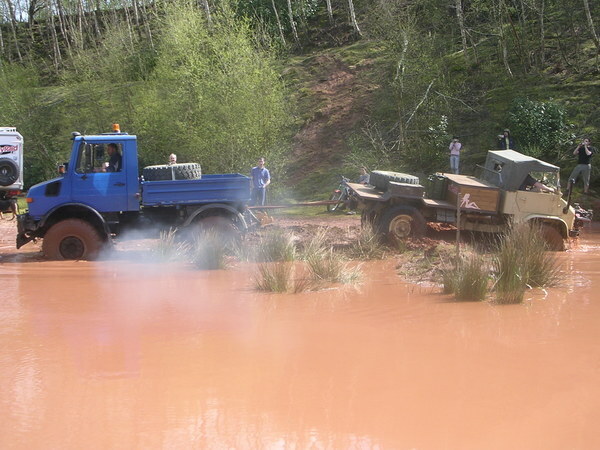 They're planning a round the world trip shortly and were "not driving in the quarry". Didn't take them long. 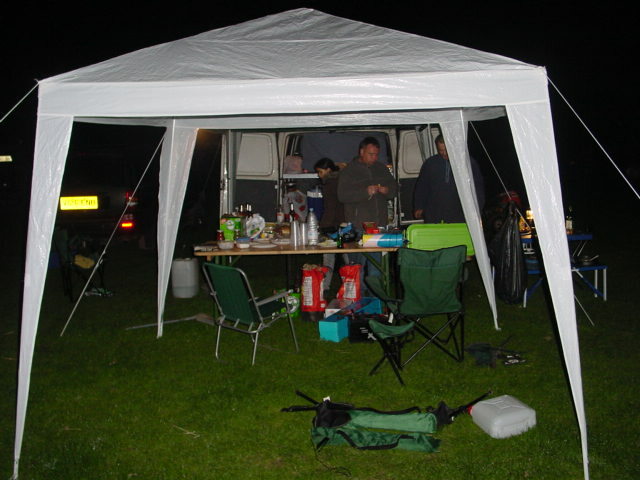 John, Eva, Greg and Arved had driven up friday night from london, and it was Johns U1300 that suffered the gearbox failire. They are also going round the world, and John seemed "comfortable" that it had gone here, with help and wagons, rather than some track in Namibia. 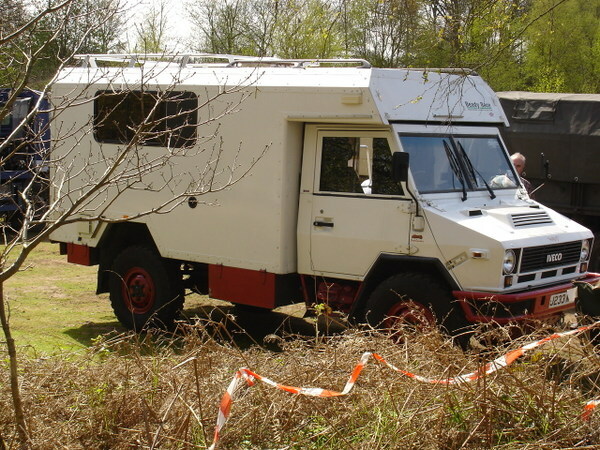 Nigel and Linda had a rather splendid Iveco Ambulance converted to a camper van, and I rather liked it. They also went exploring in the quarry. 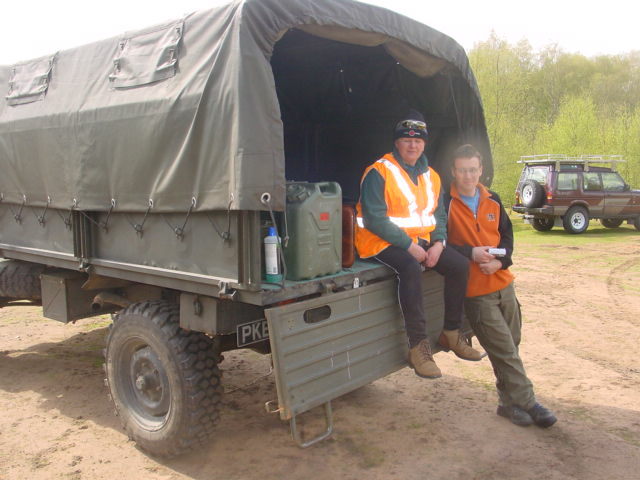 With Rick and Amanda, they formed the civilised end of the field, with chairs, tea and everything. 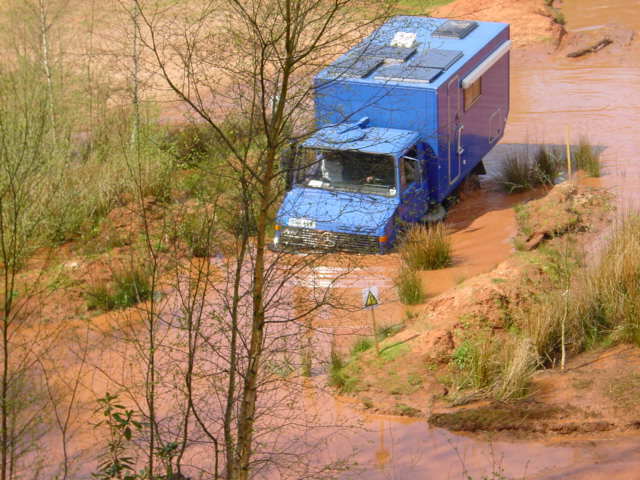 Dave managed to get his 404 stuck in a deep bit of mud (maybe the big winch doesn't help) and the brummy 404 couldn't pull it out. The 1600 was called into action again, and after a small amount of wheelspin pulled it out. It soon started with a bit of wd40 and some shaking. 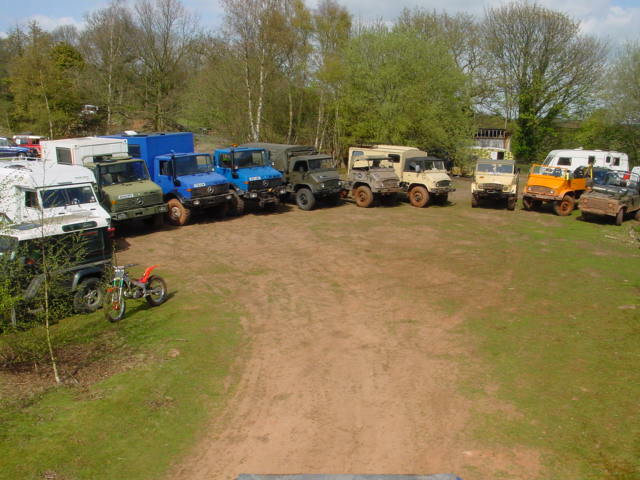 After that excitement, we gathered for a group photo firstly with the vehicles only. 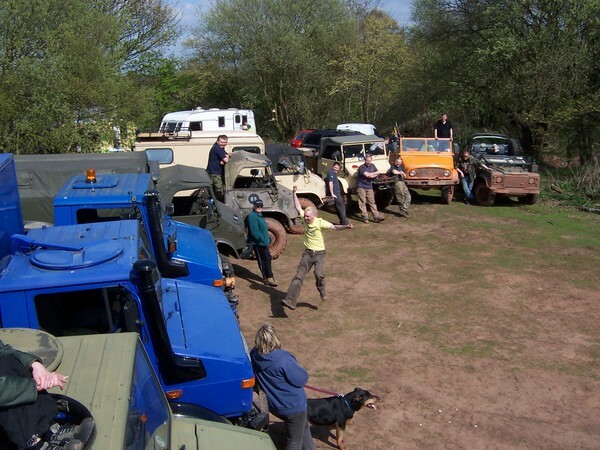 We had hoped to get everyone onto rough ground at crazy angles, but we were restricted to parking round the downed mog :( Still, is a fairly good array and the weather was perfect. Then we assembled the owners, except for mark, who is camera shy. I'd had a little too much sun, but was clearly very happy with the whole thing. Even the quarry people seemed to like us. One last bit of excitement, as we prepared to leave (and tow the 1300 with the 1600), the brummy boys went for "one last run". Their last! I pulled up behind them to find them stuck. 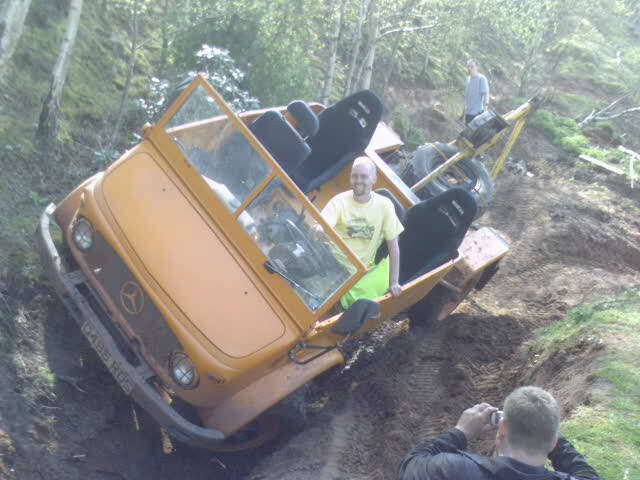 I then reversed back down the hill. 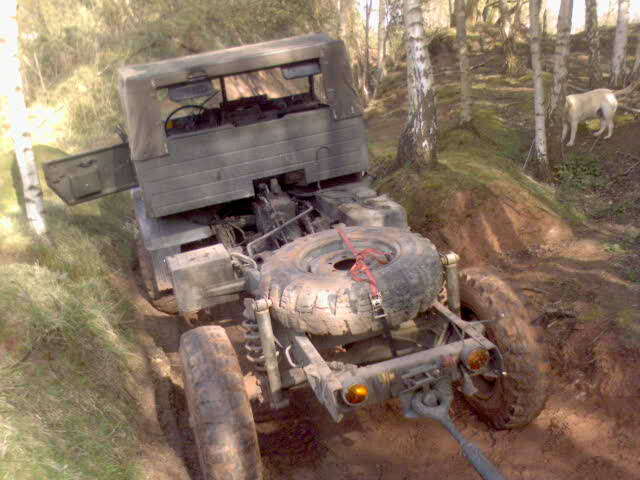 During the turn I managed to go up the banking _and_ down a rut at the same time. Got the mog to a very scary 40 or so degree's with a back wheel about 4 foot in the air. 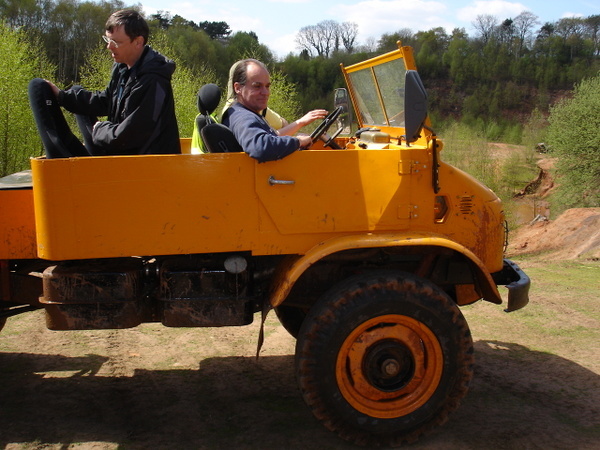 404's are great, you can feel the balance through the clutch and feel your way through - I just stopped when it tipped (looked a bit scared) and then reversed out. I turned round, backed up the banking and we pulled him out with a buddy bar. 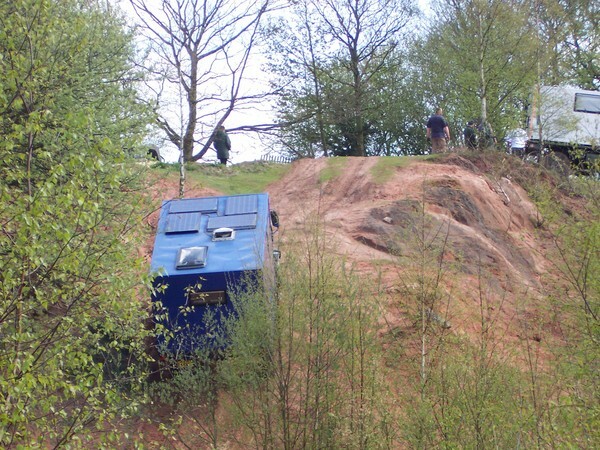 He was winched onto the back of his truck. It should have occurred to us to check the fuel filter, and that was the problem. Full of sand! We all set off to leave. It was hoped the downed mog could be towed to the farm (possibly via the pub), but it wasn't having it. John and Scott went back for them in the truck - Mog Karma! Whilst at the pub, we found out Simons 404 Radiobox had blown the clutch (suspect is plate the wrong way round) and I went for it in Ingrid the (now real) recovery truck. We went back to the farm. We had a long drawn out BBQ (6 1/2 hours! 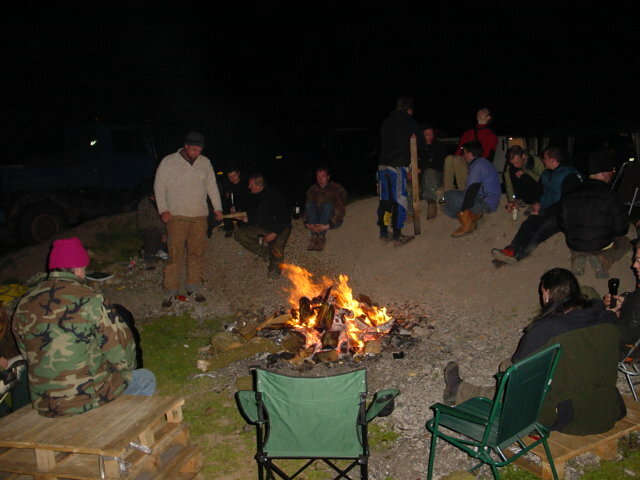 ), a campfire, huge amounts of beer, music, fire poi (both the experienced and inexperienced) and speeches. Yes, speeches. And a nice discussion that we won't go into here that had a rating scale. You can always tell when the RAF are in town! Then the absinth came out, and people started dropping! Finally hit the sack quite late, then got woken up by John to let me know it was raining at about 4.30 am - fitted the, err, roof.